They left family, friends and the things they love about Hawaii -- a temperate climate, tropical flowers, the ocean and Zippy's -- for the thrill of performing in a top show on the Las Vegas Strip. A dream come true in a manmade fantasyland in the desert. Today, Vegas is home for former Oahu residents Andres Fernandez, Sarah Harding, Jacquelyn Holland and Tony Ruivivar. They've strolled its streets, dined in its restaurants, seen its attractions and won and lost a buck or two in its casinos. 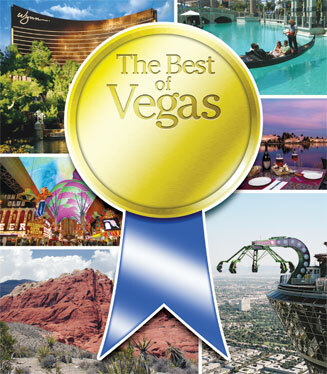 They know Vegas, and they share the best of it, at least in their opinion, with you. With more than 100 hotels and casinos, 700 restaurants, 80 shows and 95 attractions, Las Vegas can be overwhelming to anyone planning a trip there, whether it's for the first time or 40th. Four kamaaina who are performing in top shows on the Strip offer insider tips that can help you make the most of your Vegas escape. Born and raised in Honolulu, Andres Fernandez is one of four former Oahu residents performing in "STOMP OUT LOUD" at Planet Hollywood Resort and Casino (www.stompoutloudvegas.com). In 1986, he, his two brothers, and a few cousins and friends formed a dance troupe called the Body Gesture Boys, which performed at special events, private parties and concerts statewide. A 1992 graduate of Radford High School, he attended Hawaii Pacific University for two years on a cheerleading scholarship before pursuing a career in show business. "From the time I was young, I've loved to perform," said Fernandez, who's been a Las Vegas resident for four and a half years. "I love to sing and dance, but I never imagined that I would be where I am today." Fernandez loves living in a city that never sleeps. "You'll never be bored in Vegas," he said. "There's always something going on. I'm very lucky to live in the entertainment capital of the world!" Adventuredome at the Circus Circus Hotel is one of Andres Fernandez's picks for underage Vegas visitors. Best plate lunch: For hamburger steak, I go to Aloha Kitchen; it's da bomb. The adobo fried rice omelette is good there, too. For meat jun, I go to a Korean barbecue place called Island Style. Ono!!! Favorite pau hana hangout: Singing karaoke at Aloha Kitchen. Memorable day trip: During the winter we go to Mount Charleston for sledding, and in the summer we go to Lake Mead for swimming and jet skiing. About an hour north of Vegas, there's a place called the Valley of Fire. As you go over the mountains into the valley, all you see are red rock formations; it's as if you're on Mars. Very cool. Great kids activities: At Kids Quest at the Station and Coast casinos, your keiki (six weeks to 12 years old) can enjoy supervised play while you eat, gamble, shop or see a show. Among the activities: indoor playgrounds with slides and tunnels, video games, and arts and crafts. 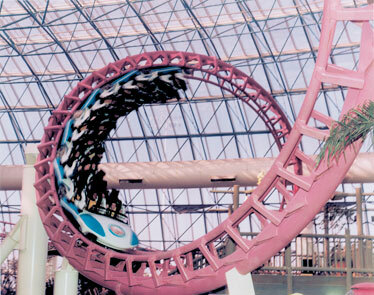 Don't forget Circus Circus, which has midway games, circus acts and an indoor amusement park called the Adventuredome. Hippest, hottest nightclub: I really like Tao at the Venetian. It has four or five different rooms, each with a different vibe, something for everyone. In the spring and summer, there's Tao Beach, a relaxing outdoor party at the hotel's pool. A DJ plays music while guests eat, sip drinks, swim and sun, sort of like a nightclub during the day. Tao Beach is put on by Tao nightclub. Biggest thrill: The rides atop the Stratosphere. I haven't been on any of them because I'm not that crazy. And? Spring is the best time to visit because the weather is nice, not too hot or too cold. There's a new indoor racetrack called Pole Position Raceway across from The Palms. The cars go about 20 to 30 miles per hour, and they all run on electricity, so you won't be inhaling any gas fumes. From the time she began her training in gymnastics at the age of 6, it was clear Sarah Harding was an exceptional athlete. She also has excelled in jazz dance, tap, ballet and springboard diving. In 1994, at age 16, Harding earned a spot on the Junior Olympic National Gymnastics team, and in her senior year at Punahou in 1996, she was recognized as Hawaii state champion in artistic gymnastics and one-meter diving. She attended Stanford University on a full scholarship in gymnastics, earning a bachelor's degree in East Asian studies and a master's degree in communication. Since then, she has worked as a choreographer, dancer and acrobat at SeaWorld in San Diego, Tokyo DisneySea and other big theme parks. She joined the cast of Cirque du Soleil's "KA" at the MGM Grand Hotel and Casino (www.ka.com) in October 2003, when the show was being developed (it opened in February 2005). "Not many people get to perform for a living, and especially not in a show that some have called a 'live video game,'" said Harding. "Cirque du Soleil is what attracted me to move to Las Vegas. 'KA' is why I love it here." Best plate lunch: There are a bunch of L&L Hawaiian Barbecue restaurants around Las Vegas. My favorite plates include kalua pork and teri beef. When I'm watching my diet, I love that I can substitute brown rice for white rice and green salad for macaroni salad. If I want lots of meat, I have the Atkins Plate. I also like Aloha Specialties and Ohana Hawaiian Barbeque. Must-see attraction: Some of the best attractions in Vegas are off the Strip. My husband and I went to the Atomic Testing Museum and found it so fascinating! If you like history and want to see an incredible multimedia timeline, check it out. Sarah Harding says GameWorks near the MGM Grand Hotel, where she performs, has a wide variety of distractions. 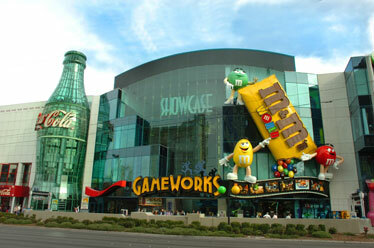 Great kids activities: There's a cool arcade called GameWorks at M&M's World adjacent to the MGM Grand. It has over 200 interactive video games plus standards like billiards, darts and shuffleboard. Most romantic spot: Marche Bacchus, a wine store and restaurant on the west side of town, near Summerlin. The outdoor seating is on a lake, manmade of course, but it's gorgeous! You feel as though you've left the desert and traveled to a lush hidden oasis. Hippest, hottest nightclub: I like Pure at Caesar's Palace and the VooDoo Lounge at the Rio Hotel. Both have amazing views of the Strip from their rooftop bars; makes you feel like you're on top of the world! Best place to people watch: The lanai seating at Paris' Mon Ami Gabi restaurant is on Las Vegas Boulevard, across the street from the Bellagio. You can enjoy good French food while you watch all kinds of people pass by. And? If you're looking for deals in Vegas, log onto KNPR Nevada's public radio site, www.knpr.org. If you pledge to support their radio broadcasts, which I believe are worthwhile, you can get some great discounts, including two-for-one lunches at L&L and Roy's, among others. Hailing from Kailua, Vegas veteran Jacquelyn Holland is a protegee of Ron Bright, Castle High School's renowned former artistic director. She grew up singing with her family in concerts at church, the Honolulu Zoo and the Waikiki Shell, "kind of like the von Trapp family of 'Sound of Music,' " she said. Holland, a 1987 Castle graduate, credits Bright with inspiring her to reach for her dreams. She has appeared as a back-up singer for Wayne Newton, a principal vocalist in the long-running "Jubilee!" at Bally's, and as Morgana and Bess Houdini opposite Rick Springfield in EFX at the MGM Grand Hotel & Casino. In 2003, she joined the cast of "Mamma Mia!" (www.mamma-mia.com) at the Mandalay Bay Resort and Casino, assuming the lead role of Donna Sheridan in 2005 and 2006. After a short stint back in Hawaii, she returned to Vegas a year and a half ago to rejoin "Mamma Mia!" "Vegas has everything, and it's open 24 hours," said Holland. "Lots of locals live here; there's a big Hawaiian community which makes us all a little less homesick." Former Kailua resident Jacquelyn Holland says visits to Red Rock Canyon keep her sane while performing in "Mamma Mia!" Cheap eats: Go to Luv-It Frozen Custard and order the Western, which comes with hot fudge, caramel and pecans. It only costs around $5. McMullan's Irish Pub has a lively band and great food at reasonable prices. Nothing beats the Irish nachos, homemade potato chips layered with cheddar cheese, bacon, tomatoes, chives and sour cream. A huge serving, enough to share, costs about $10. Dining splurge: I'm a big fan of the Golden Steer. It's 50 years old this year -- the oldest steak house in Vegas -- and serves the best prime rib you've ever tasted! Most of the waiters have been there for 25 years or more. Elvis Presley, Frank Sinatra, Dean Martin, Sammy Davis Jr. and John Wayne have dined there. It's legendary! Must-see attraction: The pool at Mandalay Bay is the closest thing we have to an ocean, complete with a wave maker, lazy river and white sand beach. At the Beach Concert Series from May through September, you can sit on the beach or wade in the surf as you listen to the music of Chicago, Foreigner, Pat Benatar and other big-name performers. Favorite pau hana hangout: Firefly on Paradise Road is romantic and fun with great music, tapas (appetizers), and big pitchers of mojitos and sangria. Lots of showpeople hang out there. I also like Red Square at Mandalay Bay for its incredible martinis and ambience. They have an ice bar and vodka locker; you put on a fur coat that they supply and taste different vodkas. Pretty swanky! Jacquelyn Holland says the gondolas at the Venetian Hotel can factor into a unique wedding plan. Memorable day trip: Red Rock Canyon is my sanity. The hiking is breathtaking and such a reward; it's the next best thing to having an ocean. It's my dog Gus' favorite place to run and explore; he loves to lie in the streams, and we found a great swimming hole with a waterfall! It can get really hot there, so pack lots of water! 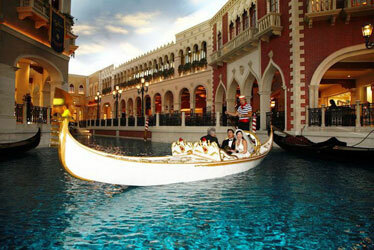 Fun way to get married: On a gondola at the Venetian. And? Take advantage of Tix4Tonight's half-price show tickets; you buy them "last minute," which means on the day you want to see a particular show. 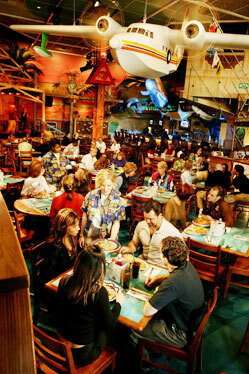 They have five locations, including Fashion Show Mall and Hawaiian Marketplace. Also, a lot of shows offer two-for-one tickets to Nevada residents. So many Hawaiians live in Vegas, you can ask your friends or relatives who live here to help you take advantage of this deal using their driver's license. Tony Ruivivar was born in Shanghai, the son of a Filipino immigrant who made his living as a musician and bandleader. When the Communist party seized power in China in 1949, Ruivivar, then a small boy, and his family wound up in a refugee camp in the Philippines. In the early 1960s, they moved to Hong Kong, where Ruivivar met fellow entertainer Bert Sagum. They formed the Fabulous Echoes, which played the nightclub circuit in Hong Kong, Thailand and Japan. Renamed the Society of Seven (www.societyofseven.com), the group took their act to Las Vegas in 1964. Four years later, Hawaii beckoned and became home. Although its members have changed over the years, SOS is celebrating its 38th year in the Outrigger Waikiki's main showroom. 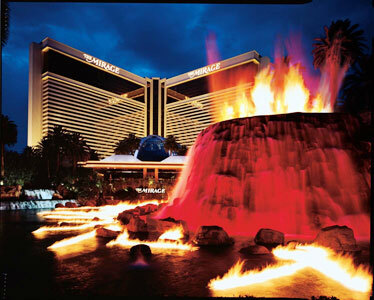 Tony Ruivivar says free shows, like The Mirage's nightly volcanic eruption, are not to be missed. Since 2001, Ruivivar has led SOS's "brother group" in Vegas, which is now the headliner at the Flamingo Las Vegas. "I love living in Vegas," he said. "You can get local grinds here, there are many Hawaiians here and the aloha spirit is here, but where's the ocean, brah?" Tony Ruivivar says Margaritaville Caf at the Flamingo Hotel is a great place to grab a burger and a beer and people watch. Best plate lunch: I like Aloha Specialties on the second floor of the California Hotel in downtown Vegas. My favorite is the hamburger steak with macaroni salad and rice smothered in gravy and onions. I usually have a Spam musubi as a side order. Cheap eats: The Midnight Special in the Suncoast Hotel and Casino's coffee shop is eggs, bacon, sausages and pancakes for $1.99. For $2.99, you get steak, eggs and pancakes! Memorable day trip: Hoover Dam with a stop in Boulder City where there's a small rock, gem and anthropology store. Kids love to buy genuine dinosaur poop that's crystallized. Top casinos: Most beautiful casino, Bellagio; most popular casino, Venetian; best slot machine payoffs, Suncoast; best craps, California Hotel; best table games, Red Rock Casino. Most romantic spot: The Fontana Bar and Lounge at the Bellagio. It has soft live music and a big dance floor, and you sip fine cognacs, wines, mixed drinks and imported beers by candlelight, looking out at the hotel's famous dancing fountains and the bright lights of the Strip. Best place to people watch: Margaritaville Caf at the Flamingo Hotel, which is at the corner of the busiest intersection in Vegas. There's constant foot traffic in every direction, the cheeseburgers are great and so are the beers. And? Don't miss the free shows, like the volcano eruption at the Mirage, the battle of the sirens and pirates at Treasure Island, the dancing colored fountains at Bellagio, the talking statues at the Forum Shops at Caesar's Palace and the Fremont Experience in downtown Vegas. If you get tired of the hustle and bustle of Vegas, drive in any direction and you'll be in an entirely different environment. 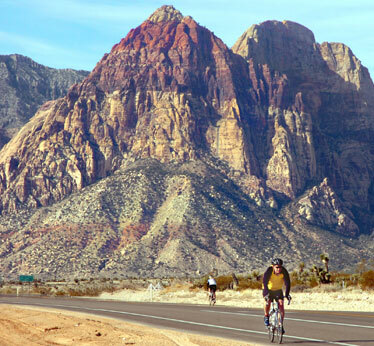 You're just a few hours away from the ski slopes of Utah, the dazzle of Hollywood, the golf courses of Arizona, the laid-back feeling of Palm Springs, the rolling hills of wine country and the grandeur of the Grand Canyon and Zion National Park. Cheryl Chee Tsutsumi is a Honolulu-based freelance writer whose award-winning Hawaii's Back Yard column appears each Sunday in the Star-Bulletin Travel section.